Puget Sound Partnership has honed its high-level game plan for restoring the Puget Sound ecosystem, including a sharp focus on 10 “vital signs” of ecological health. 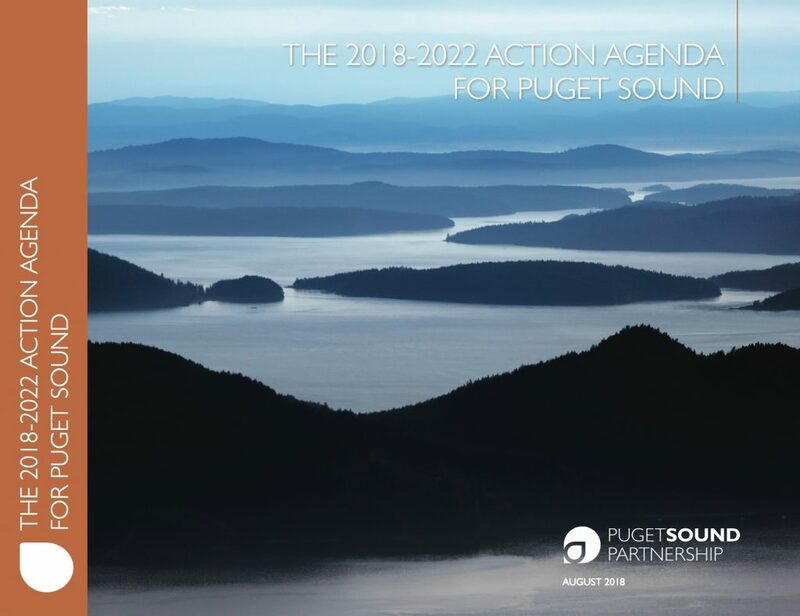 The newly released draft of the Puget Sound Action Agenda has endorsed more than 600 specific “near-term actions” designed to benefit the ecosystem in various ways. Comments on the plan will be accepted until Oct. 15. Visit the Partnership’s webpage to view the Draft Action Agenda and access the comments page. The latest Action Agenda for 2018-2022 includes a revised format with a “comprehensive plan” separate from an “implementation plan.” The comprehensive plan outlines the ecological problems, overall goals and administrative framework. The implementation plan describes how priorities are established and spells out what could be accomplished through each proposed action. Nearly 300 near-term actions are listed at Tier 4, the highest level of priority, giving them a leg up when it comes to state and federal support, according to Heather Saunders Benson, Action Agenda manager. Funding organizations use the Action Agenda to help them determine where to spend their money. The greatest change in the latest Action Agenda may be its focus on projects that specifically carry out “Implementation Strategies,” which I’ve been writing about on and off for nearly two years. Check out “Implementation Strategies will target Puget Sound ‘Vital Signs’” in the Encyclopedia of Puget Sound. Southern Resident killer whales, cherished by many Puget Sound residents, are on a course headed for extinction, and they could enter a death spiral in the not-so-distant future. It is time that people face this harsh reality, Ken Balcomb told me, as we discussed the latest death among the three pods of orcas. A 2-year-old male orca designated J-52 and known as Sonic died tragically about two weeks ago. Two-year-old J-52, known as Sonic, swims with his mother J-36, or Alki, on Sept. 15. This may have been the last day Sonic was seen alive. The young orca was last seen in emaciated condition, barely surfacing and hanging onto life near the entrance to the Strait of Juan de Fuca on Sept. 15. 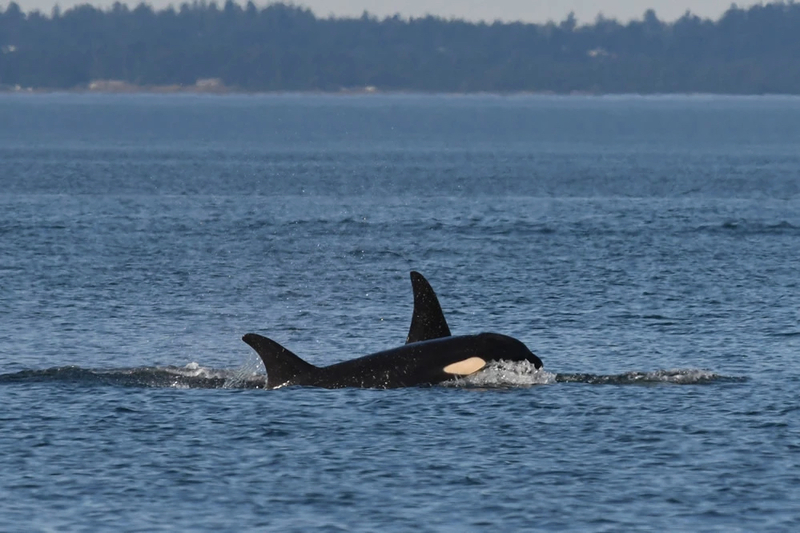 Ken, director of the Center for Whale Research, said the young whale was attended to by his mother Alki, or J-36, along with a male orca, L-85, known as Mystery — who may have been Sonic’s father, but more about that later. Extinction, Ken told me, is “very real” — not some ploy to obtain research dollars. The population of endangered Southern Residents has now dropped to 76 — the lowest level since 1984. Most experts agree that a shortage of chinook salmon — the primary prey of the orcas — is the greatest problem facing the whales. Last week, the Leadership Council — the governing body of the Puget Sound Partnership — discussed what role the partnership should play to “accelerate and amplify efforts” to restore chinook salmon runs and save the orcas. Chinook themselves are listed as a threatened species. Puget Sound Partnership is charged by the Legislature with coordinating the restoration of Puget Sound, including the recovery of fish and wildlife populations. The Leadership Council delayed action on a formal resolution (PDF 149 kb) in order to allow its staff time to identify specific actions that could be taken. Although the resolution contains the right language, it is not enough for the council to merely show support for an idea, said Council Chairman Jay Manning. 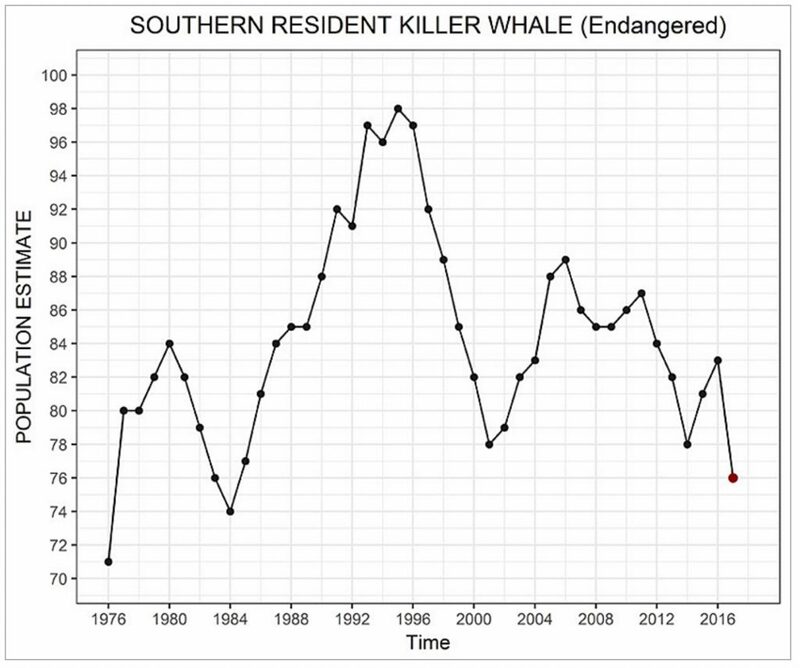 Sonic was one of the whales born during the much-acclaimed “baby boom” from late 2014 through 2015. With his death, three of the six whales born in J pod during that period have now died. No new calves have been born in any of the Southern Resident pods in nearly a year. Meanwhile, two orca moms — 23-year-old Polaris (J-28) and 42-year-old Samish (J-14) — died near the end of 2016. Those deaths were followed by the loss of Granny (J-2), the J-pod matriarch said to have lived more than a century. Another death was that of Doublestuf, an 18-year-old male who died last December. Three orcas were born in L pod during the baby boom, and none of those whales has been reported missing so far. Ken believes he witnessed the final hours of life for young Sonic, who was lethargic and barely surfacing as the sun set on the evening of Sept. 15. 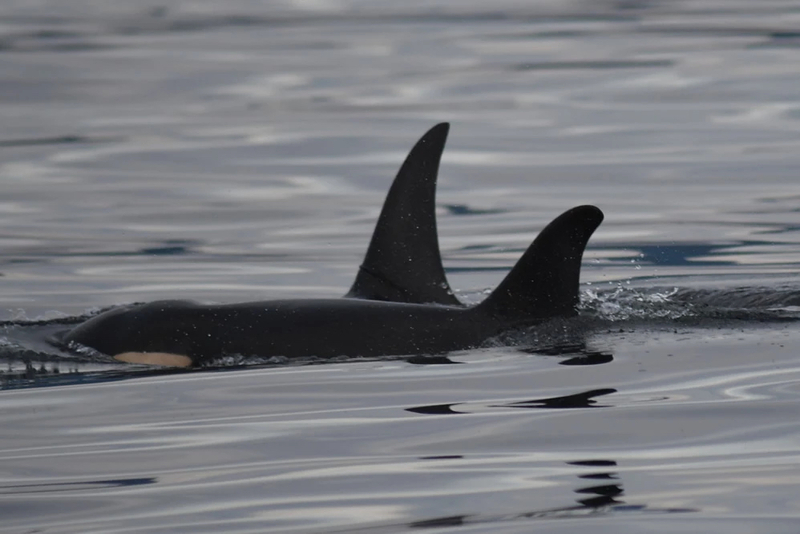 Two adults — Sonic’s mother and Mystery — were the only orcas present, while the rest of J pod foraged about five miles away. Sonic seen with his mother in June. That was the last time anyone saw Sonic, although his mother Alki as well as Mystery were back with J pod during the next observation four days later. Ken reported that Alki seemed distressed, as often happens when a mother loses an offspring. Ken admits that he is speculating when he says that Mystery may have been Sonic’s father. It makes for a good story, but there could be other reasons why the older male stayed with the mother and calf. Still, researchers are engaged in studies that point to the idea that mature killer whales may actually choose a mate rather than engaging in random encounters. I’m looking forward to the upcoming report. I must admit that this issue of extinction has been creeping up on me, and it’s not something that anyone wants to face. Food is the big issue, and chinook salmon have been in short supply of late. It will be worth watching as the whales forage on chum salmon, as they are known to do in the fall months. “This population cannot survive without food year-round,” Ken wrote in a news release. “Individuals metabolize their toxic blubber and body fats when they do not get enough to eat to sustain their bodies and their babies. Your diet doctor can advise you about that. “All indications (population number, foraging spread, days of occurrence in the Salish Sea, body condition, and live birth rate/neonate survival) are pointing toward a predator population that is prey-limited and nonviable,” he added. The Center for Biological Diversity, which was involved in the initial lawsuit that led to the endangered listing for the whales, is calling upon the NOAA’s National Marine Fisheries Service to move quickly to protect orca habitat along the coasts of Washington, Oregon and California. Currently designated critical habitat is limited to Puget Sound, even though the whales are known to roam widely along the coast. How fast the whales will go extinct is hard to determine, experts say, but the current population is headed downward at an alarming rate, no matter how one analyzes the problem. “I would say we are already in a very dangerous situation,” said Lance Barrett-Lennard, senior marine mammal researcher at the Vancouver Aquarium. “If this trajectory continues and we lose two or three more from deaths or unsuccessful birth, we will be in a real spiral,” he told reporter Richard Watts of the Times Colonist in Victoria, B.C. A five-year status review (PDF 4.3 mb), completed last December by NMFS, takes into account the number of reproductive males and females among the Southern Residents, the reproductive rates, and the ratio of female to male births (more males are being born). As the population declines, the risk of inbreeding — and even more reproductive problems — can result. Eric Ward of NOAA, who helped write the status report, said the agency often estimates an extinction risk for endangered populations, but the actual number of Southern Residents is too small to produce a reliable number. Too many things can happen to speed up the race toward extinction, but it is clear that the population will continue to decline unless something changes. As Ken describes it in simple terms, Southern Resident females should be capable of producing an offspring every three years. With 27 reproductive females, we should be seeing nine new babies each year. In reality, the average female produces one offspring every nine years, which is just three per year for all three pods. That is not enough to keep up with the death rate in recent years. To make things worse, reproductive females have been dying long before their time — and before they can help boost the population. Experts talk about “quasi-extinction,” a future time when the number of Southern Residents reaches perhaps 30 animals, at which point the population is too small to recover no matter what happens. Some say the population is now on the edge of a death spiral, which may require heroic actions to push the population back onto a recovery course. As described in the five-year status review, prey shortage is not the only problem confronting the Southern Residents. The animals are known to contain high levels of toxic chemicals, which can affect their immune systems and overall health as well as their reproductive rates. Vessel noise can make it harder for them to find fish to eat. On top of those problems is the constant threat of a major oil spill, which could kill enough orcas to take the population down to a nonviable number. The graph shows the probability that the Southern Resident population will fall below a given number (N) after 100 years. Falling below 30 animals is considered quasi-extinction. The blue line shows recent conditions. Lines to the left show low chinook abundance, and lines to the right show higher abundance. Despite the uncertainties, Robert Lacey of Chicago Zoological Society and his associates calculated in 2015 that under recent conditions the Southern Resident population faces a 9 percent chance of falling to the quasi-extinction level within 100 years. Worsening conditions could send that rate into a tailspin. See report for Raincoast Conservation Foundation. What I found most informative was how the probability of extinction changes dramatically with food supply. (See the second graph on this page.) A 10 percent decline in chinook salmon raises the quasi-extinction risk from 9 percent to 73 percent, and a 20 percent decline raises the risk to more than 99 percent. On the other hand, if chinook numbers can be increased by 20 percent, the whales would increase their population at a rate that would ensure the population’s survival, all other things being equal. 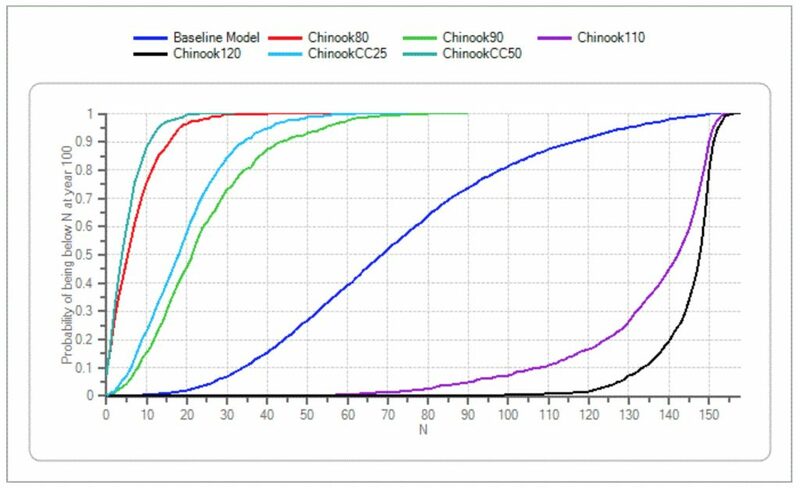 Two additional lines on the graph represent a gradual decline of chinook as a result of climate change over the next 100 years — a condition that also poses dangerous risks to the orca population. The close links between food supply and reproductive success are explored in a story I wrote last year for the Encyclopedia of Puget Sound. At last Wednesday’s Puget Sound Leadership Council meeting, members discussed a letter from the Strait (of Juan de Fuca) Ecosystem Recovery Network (PDF 146 kb) that called on the Puget Sound Partnership to become engaged in salmon recovery efforts outside of Puget Sound — namely the Klamath, Fraser and Columbia/Snake river basins. “Such collaborative efforts must be done for the benefit of both the SRKW and chinook fish populations, without losing sight of the continuing need to maintain and improve the genetic diversity of these fish populations …” states the letter. Rein Attemann of Washington Environmental Council said salmon on the Columbia and Snake rivers, as well as he Fraser River in British Columbia, are “vitally important” to the recovery of the Southern Resident killer whales, and Puget Sound efforts should be coordinated with other programs. Jim Waddell, a retired civil engineer with the Army Corps of Engineers, spoke forcefully about the need to save chinook salmon and the Southern Residents, starting by tearing down dams on the Snake River. An environmental impact statement on chinook recovery includes the option of breaching the dams, something that could be pushed forward quickly, he said. Puget Sound Partnership may take a stand on whether fish farms should be allowed to remain in Puget Sound waters. The partnership is charged by the Legislature to oversee the restoration of the Puget Sound ecosystem. On Wednesday, the partnership’s governing body, the Puget Sound Leadership Council, received an update on last month’s collapse of a net pen containing 305,000 Atlantic salmon near Cypress Island in northern Puget Sound. About 100,000 Atlantic salmon apparently escaped and have not been caught by people, although most of those probably were eaten by predators, experts say. Officials continue their efforts to figure out where any remaining fish have gone, specifically any that swam up into the streams, according to Amy Windrope of the Washington Department of Fish and Wildlife. The Atlantic salmon, an exotic species in Puget Sound, don’t appear to be eating anything, let alone young native salmon, Windrope said, and there is not much concern that they will breed with native fish. The greatest concern is that they might somehow disrupt the spawning behavior of native salmon, whose populations are already stressed by adverse conditions in both marine and fresh water. The Atlantic salmon appeared to be healthy and free of parasites at the time of the release, she said, but they became less and less healthy as starvation set in. In addition to Windrope, the presentation to the Leadership Council included reports from representatives of the state Department of Natural Resources, which leases the seabed where the pens are located, and the Department of Ecology, which issues permits under water-quality laws. Puget Sound tribes are about to release a position statement opposing salmon farms in Puget Sound, said Russell Hepfer, a member of the Leadership Council and vice chairman of the Lower Elwha Klallam Tribal Council. He did not elaborate, except to say that the non-native fish don’t belong here. According to Windrope, the tribes see Atlantic salmon as weeds in the garden of Puget Sound. Such cultural viewpoints should be taken into account in the overall discussion, she added. Soon after the Cypress Island net pen collapse, Washington Gov. Jay Inslee and Public Lands Commissioner Hilary Franz issued a moratorium blocking further net pen approvals until an investigation is complete. Maradel Gale, a resident of Bainbridge Island, addressed the Leadership Council at Wednesday’s meeting near Port Gamble, saying the Bainbridge Island City Council has effectively limited the expansion of net pens at the south end of the island and would like to get rid of net pens altogether. She said Cooke Aquaculture, which owns all the net pens at four locations in Puget Sound, receives the benefits of using the public waterways and placing the ecosystem in peril while taking very little risk upon itself. Dennis McLerran, a member of the Leadership Council who has worked for various environmental agencies, said Washington state law has long provided a preference for aquaculture over many other shoreline uses. Like it or not, he said, those preference are “baked into state policies” that direct state agencies to support aquaculture, including salmon farms. The state of Alaska prohibits salmon farms, while California’s complex regulations allow them only under specific conditions related to water supplies, said Kessina Lee of Ecology. Jay Manning, chairman of the Leadership Council and former director of the Washington Department of Ecology, said the Legislature will no doubt want to hear a complete report on the Cypress Island net-pen collapse, and he urged the agency officials to be fully prepared to answer questions from lawmakers. “You will be asked, when the Legislature comes back, ‘How big a deal is this?’” Manning said, noting that he has heard from some people that it is a very big deal, while others say it is nothing at all. Windrope noted that native salmon populations are already struggling, “and this is one more injury to the salmon.” But since the escaped Atlantic salmon don’t appear to be competing for food, the question comes down to whether they are affecting native fish in other ways. That question is not fully answered, she said. DNR serves as the landlord for the Puget Sound net pen operations, he said. The aquatic leases run out at various times, from 2022 to 2025, and the agency is taking a closer look at the net pen structures to see what should be done from both a scientific and landlord perspective. Commissioner Franz is taking a special interest, he added. Rich Doenges of Ecology said the Atlantic salmon that got away are considered a “pollutant” under Washington state law. While no long-term effects have been seen following previous escapes of Atlantic salmon, there is some risk to native salmon. The key is to quantify that risk and determine if it is low enough to make the operations worthwhile. If necessary, he said, compliance orders can be issued and state water-quality permits can be amended to require additional safety measures. Seattle attorney Doug Steding, representing Cooke Aquaculture, said he wanted to convey “sorrow and regret” from the company over the potential impacts of the escape. “We want to make right with respect to this terrible accident,” he said, adding that the company is committed to working with investigators into the cause of the escape and finding ways to make sure that it never happens again. Steding noted that Cooke recently acquired the Puget Sound facilities and did not own the Cypress Island net pens when the fish were placed in them. The company should have shared more information with the public about plans to upgrade the facilities, he said. “You have an important task sorting through the difficult science and integrating with the values of the people of Washington,” Steding told the Leadership Council, adding that Cooke hopes to remain a part of the discussion. 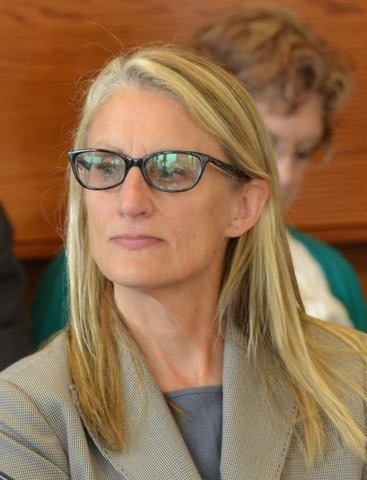 Martha Kongsgaard, chairwoman of the Puget Sound Leadership Council, has always spoken with a voice of both reason and passion while guiding the Puget Sound Partnership in its efforts to restore Puget Sound to health. Yesterday and today, Martha attended her final meeting as a member of the Leadership Council, the governing body of the Partnership charged with coordinating Puget Sound ecosystem recovery. While listening to presentations on technical and financial issues, Martha always seems to quickly focus discussions on the key issues of recovery while asking how to help average people understand the complex problems. As a reporter, I’ve enjoyed speaking with Martha, who not only answers my questions in a direct and revealing way but also indulges my curiosity. Our discussions often take tangents onto other interesting subjects, sometimes leading to new stories or old stories told in a new way. Nobody doubts Martha’s love of Puget Sound, expressed by her willingness to spend countless unpaid hours working for a better future. Puget Sound Partnership continues to struggle in its efforts to pull everyone together in a unified cause of protecting and restoring Puget Sound. This week, the Puget Sound Leadership Council, which oversees the partnership, adopted the latest Puget Sound Action Agenda, which spells out the overall strategies as well as the specific research, education and restoration projects to save Puget Sound. The goal of restoring Puget Sound to health by 2020 — a date established by former Gov. Chris Gregoire — was never actually realistic, but nobody has ever wanted to change the date. The result has been an acknowledgement that restoration work will go on long after 2020, even though restoration targets remain in place for that date just four years away. A letter to be signed by all members of the Leadership Council begins to acknowledge the need for a new date. 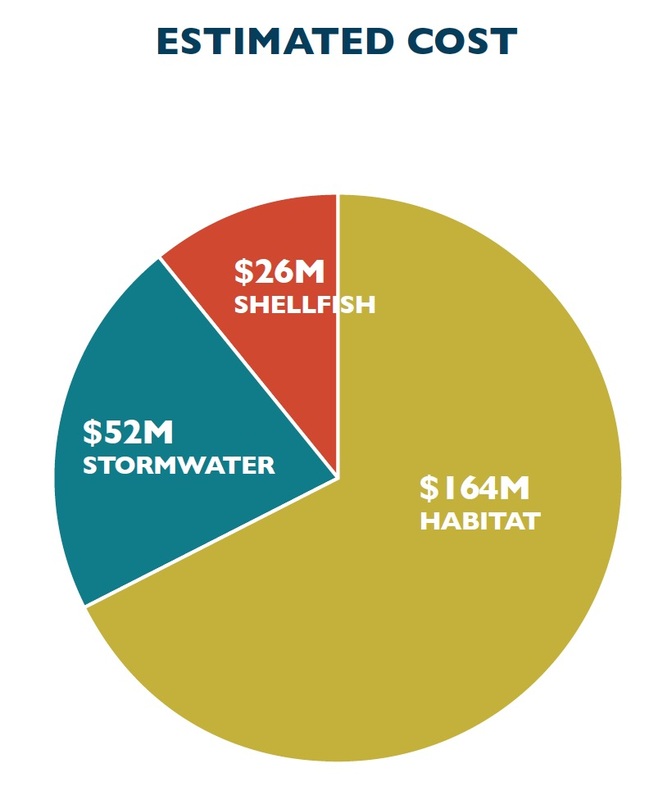 The cost for the near-term actions in the Action Agenda total nearly $250 million, with most going for habitat restoration. This is not necessarily an appeal for money to support the Puget Sound Partnership, although funds for the program have been slipping. 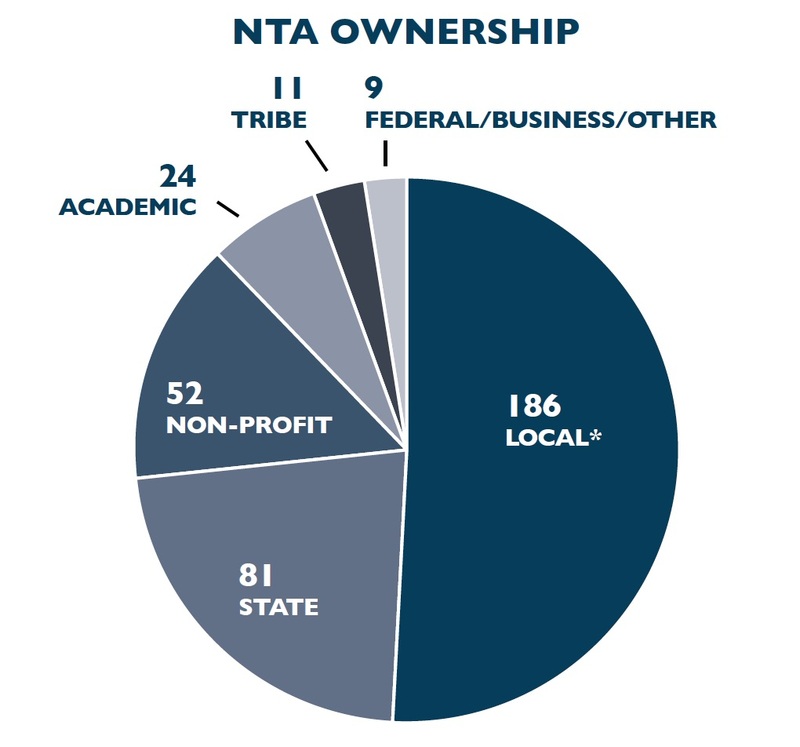 But the partnership has always been a coordinator of projects by local, state and federal agencies, nonprofit groups and research institutions — where the on-the-ground work is done. That much larger pot of money for Puget Sound efforts also is declining. “These are threats that compel us to action, fueled by our devotion to place,” the letter continues. “We at the Puget Sound Partnership, along with our local, tribal and regional partners, have a vision of a resilient estuary that can help moderate the increasing pressures of a changing world. The newly approved Action Agenda is the outcome of a greater effort to reach out to local governments and organizations involved in the restoration of Puget Sound. Priorities for restoration projects were developed at the local level with an emphasis on meeting the priorities and strategies developed in previous Action Agendas. Stormwater: Prevent pollution from urban stormwater runoff, which causes serious problems for marine life and humans. Habitat: Protect and restore habitat needed for species to survive and thrive. Shellfish: Protect and recover shellfish beds, including areas harvested by commercial growers and recreational users. Actions are focused on 29 specific strategies and 109 substrategies that support these ideas. Projects, which may be viewed in a list at the front of the “Implementation Plan,” are aligned with the substrategies. “This leaner, scientifically grounded strategic recovery plan is a call to action,” the letter from the Leadership Council states. “We know that our restoration efforts are failing to compensate for the thousands of cuts we continue to inflict on the landscape as our population grows and habitat gives way to more humans. When it comes to restoring the Puget Sound ecosystem, human beings really do matter — in some ways that are obvious and in some ways that are fairly subtle. The Puget Sound Leadership Council, which oversees the restoration of Puget Sound, acknowledged this fact yesterday when adopting a new set of ecosystem indicators to measure how Puget Sound influences the health and well-being of humans. It’s often said that people have damaged the Puget Sound ecosystem through years of abuse. They say it will take years of restoration — by people — to return things to a healthy condition. But why do we care? Are we spending millions of dollars on restoration just to benefit fish and wildlife, or are we doing it for ourselves? The answer, which comes from studies of economics and human behavior, appears to be that helping fish and wildlife — by putting the ecosystem back together — also benefits humans in a variety of ways. The other three goals are related to native species, habitats and water supplies. Sometimes goals related to human values conflict with goals to restore ecological functions. For example, one cannot build a house on undeveloped land without altering the ecosystem in some negative ways. Sometimes human values are aligned with ecological values, such when we reduce pollution to clean up streams and drinking water. In any case, these new ecosystem indicators will help people understand the tradeoffs and opportunities of various actions. As I pointed out last month in Water Ways, the Hood Canal Coordinating Council has completed a plan and associated website that highlights connections between human well-being and natural resources in the Hood Canal region. Hood Canal became a pilot project for the indicators approved yesterday for all of Puget Sound. 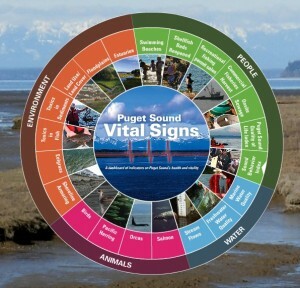 Some of the same folks — including social scientist Kelly Biedenweg of the Puget Sound Institute — were involved in creating nine new “vital signs” with indicators to track human-related changes in the Puget Sound ecosystem. Unlike the original human health and human well-being indicators adopted in 2010, these new indicators have undergone an extensive review by scientists and other experts to ensure their validity and reliability. That is, these new indicators have real meaning in connecting human beings to the ecological functions of Puget Sound. In yesterday’s meeting, Martha Kongsgaard, chairwoman of the Leadership Council, said the human dimension is often ignored in favor of empirical science. Council member Stephanie Solien said she would like to see more discussions about human health and well-being issues — not because they are more important than species and habitats, but because they make connections to average people. Hear the full discussion on TVW in the video player on this page, and download the resolution and backup documents (PDF 2.9 mb) from the Puget Sound Partnership’s website. 1. OUTDOOR ACTIVITY: Measured by 1) Percent of swimming beaches meeting bacterial standards (one of the existing indicators), 2) Average hours people spend having fun outdoors, 3) Average hours people spend working outdoors. 2. AIR QUALITY: Indicators to be determined from existing data. 3. LOCAL FOODS: Availability of wild foods, such the ability to catch fish, collect shellfish, harvest plants and hunt for game. 4. DRINKING WATER: Indicators to be determined from information about water systems. 5. ECONOMIC VITALITY: Measured by 1) Value of natural resources produced by industry, including commercial fishing, shellfish harvesting, timber production, agriculture, mining and tourism; 2) Value produced by natural-resource industries compared to gross domestic product of all other industries in the region; 3) Number of jobs in natural-resource industries. 6. CULTURAL WELL-BEING: Percent of residents who feel they are able to maintain traditions associated with the natural environment. 7. GOOD GOVERNANCE: Percentage of people who feel they have 1) the opportunity to influence decisions about Puget Sound, 2) the rights and freedom to make decisions about managing natural resources, 3) trust in local and regional governments to make the right decisions about Puget Sound, 4) been well represented by government leaders, 5) access to information about natural-resource issues. 8. SENSE OF PLACE: Percentage of people who feel: 1) a positive connection to the region, 2) a sense of stewardship for the watershed, 3) a sense of pride about being from Puget Sound. 9. PSYCHOLOGICAL WELL-BEING INDEX: Percentage of people who experience: 1) inspiration from being in nature, 2) reduced stress, calm or relaxation from being in nature, 3) Overall life satisfaction based on criteria in national studies. 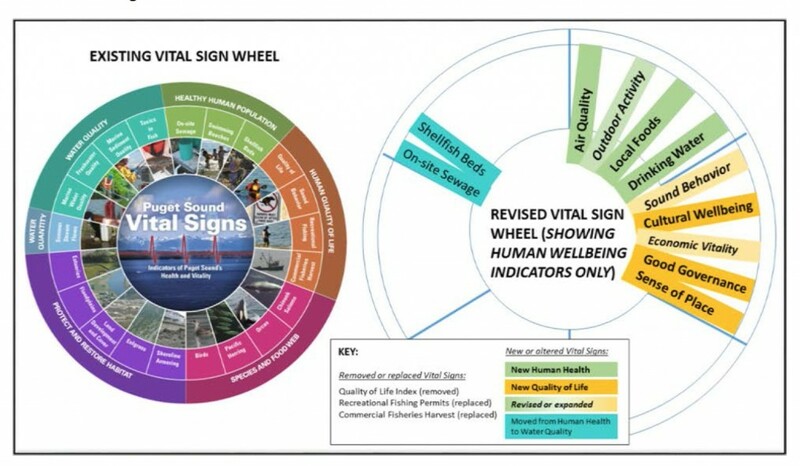 A new vital sign wheel will add nine indicators for human health and well-being. Two indicators were moved to another area. Leadership Council member Jay Manning, former director of the Washington Department of Ecology, said he supports the indicators. His only concern is that some are beyond the control of the Puget Sound Partnership, and some may have nothing to do with people’s connection to Puget Sound. Jay makes a good point, but the social scientists who developed the indicators stressed that there will be no targets or goals associated with human values. What will be interesting to watch is whether people feel better or worse about the restoration effort as time goes on, and how the leaders choose to respond to any changes in public opinion. Much of the information that will fit into the new indicators will be the result of phone surveys yet to be conducted. Other information will be teased out of ongoing research studies. The partnership has received funding from the Environmental Protection Agency to hire a consultant to continue work on the human-related indicators until the numbers are finalized. None of the new information about human health and well-being will be included in the State of Puget Sound report to be issued later this year, according to Kari Stiles, staff scientist for the partnership. But some information could go into the Vital Signs wheel within the next year. I was reading my email Friday when a press release from the governor landed in my in-box. That’s strange, I thought. What happened to Gerry O’Keefe, who had served in the ranks of the partnership before being named interim director and then permanent director just 16 months ago. Before I wrote my story, I interviewed numerous people. As far as I could tell, O’Keefe’s departure came as a complete surprise to nearly all the staff at the partnership, to members of the Ecosystem Coordination Board and to others close to the agency. The press release still leaves me wondering a bit, but I can thank Martha Kongsgaard, chairwoman of the Puget Sound Leadership Council, for speaking candidly to me about what happened. To summarize, Martha said the governor wanted a higher profile person in the post, someone who could have an impact with the Legislature; converse with federal, state and local entities; and connect with the public. Clearly, the governor would like the Puget Sound Partnership (“her baby,” Martha said) to survive and hopefully to thrive as a new governor comes on next year. You can read Martha’s comments to me in the story I wrote for yesterday’s Kitsap Sun. Martha also prepared a written message for the Puget Sound Partnership’s website, recognizing O’Keefe’s contributions in more detail than the governor. I could not reach O’Keefe Friday, so I can’t report how he’s taking the news, but Martha and others have told me that he is likely to take a job with the Washington Department of Ecology. No doubt the position will be less stressful. As for Wright, everyone I have interviewed is impressed with his success as district engineer and commander for the Seattle District of the Army Corps of Engineers. “I like him,” is a direct quote from several people. I have never been formally introduced to Col. Wright, but I do recall his testimony before the Puget Sound Leadership Council about a year ago, when he told council members they need to get some “courage” in dealing with land-use issues, such as development along the shoreline. Of course, he realized that much shoreline development falls under the purview of cities and counties, but it is the job of the Puget Sound Partnership to push local governments to do the right thing for Puget Sound. He also told me that, as an Army officer, he has tried to be apolitical, which could help him work across party lines on restoring Puget Sound and managing the partnership. I’m glad he is bringing that kind of attitude to the Puget Sound Partnership. I’m looking forward to reporting on how Col. Anthony Wright leads the way. Puget Sound Partnership has completed 19 ecosystem “targets” that will serve as mileposts on the road to restoring Puget Sound to a healthy condition. Ecosystem indicators and targets, along with other information, can be accessed from this "Vital Signs" wheel. Click on image to link to the PSP website. The final three goals, all dealing with land-use issues, were approved Thursday by the Puget Sound Leadership Council, as I described in a story published in today’s Kitsap Sun. This a major milestone for the partnership. 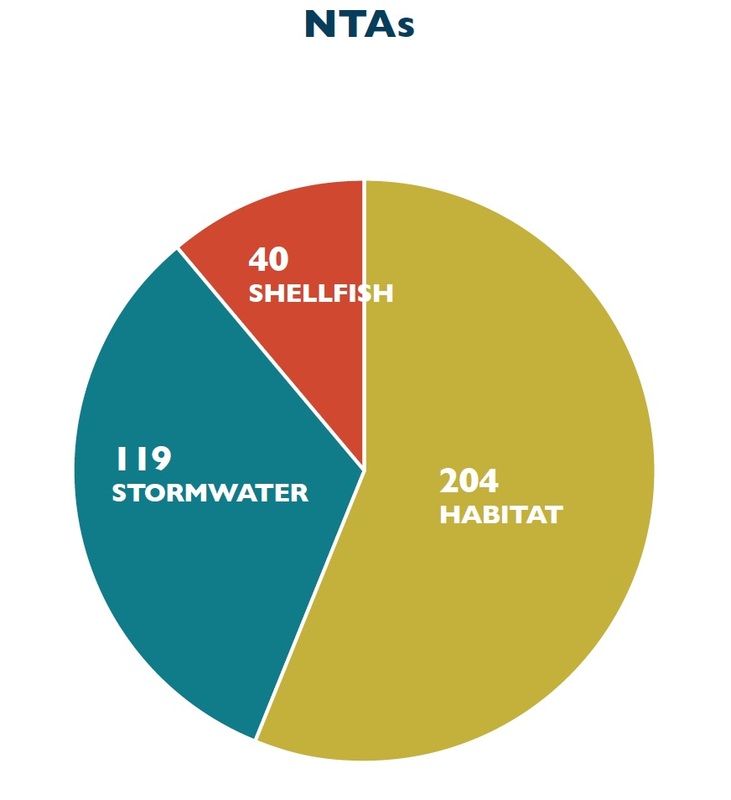 The other 16 targets are described in a two-page document found on the partnership’s website: Puget Sound Ecosystem Recovery Targets (PDF 392 kb). The website also includes information about ecosystem indicators and targets, along with other information, on a “Vital Signs” wheel. Click on the image above to use the new tool. One concern, as I’ve said before, is that too much focus may shift to these targets to the exclusion of other potential problems. The partnership’s Science Panel and Ecosystem Coordination Board must keep their eyes on the entire Puget Sound ecosystem. They must make sure the approved indicators and targets advance recovery and protection efforts everywhere in Puget Sound. Monitoring will be needed to measure advancement toward the approved targets, of course. We also need monitoring to measure the success of recovery projects and their effects on smaller ecosystems, particularly estuaries. Although it requires long-term stable funding to achieve, without monitoring, there can be no performance accountability, and the opportunities to make improvements in ecosystem recovery are constrained. Because of its critical importance, the Partnership will develop and implement a coordinated regional monitoring program to inform the adaptive management process and support decisions about future ecosystem recovery and information needs. Support from diverse interests depends on the partnership staying on a path defined by science, as I discovered in my interviews earlier this year assessing the Puget Sound Partnership. See Kitsap Sun, Feb. 5, 2011. With targets now in place, I hope the partnership will be fearless in its assessment of success. Some failures are inherent in this system. While the partnership has struggled with administrative processs during these early years, there’s too much at s take for less than a clear-eyed vision of what needs to be done. Last week, the Puget Sound Partnership completed work on its ecosystem targets, the first time in history that goals have been established for the restoration of Puget Sound. See the story I wrote for Saturday’s Kitsap Sun. Early in her first term, Gov. Chris Gregoire established a goal of restoring Puget Sound to health by the year 2020. What we have learned since then is that nobody can define precisely what that means. There is no battery of tests to be given to the waterway that would allow a team of doctors to declare their patient in fine condition. In human terms, one can say a healthy person is one free of serious disease. But for some people that is not enough. Some are satisfied with nothing less than top athletic form. It’s even more complicated for Puget Sound, where some parts of the water body can be pristine while others are in need of intensive care. Readers may be interested in this commentary from Rep. Dave Upthegrove published Wednesday in the online Seattle PI. Upthegrove, a Democrat from Des Moines, was one of the principal authors of the legislation that created the Puget Sound Partnership. During Dicks’ tenure at the helm of this new agency, he distinguished himself as a strong leader who was able to corral diverse interests to unite for a common goal: a healthy Puget Sound by 2020. David Dicks will leave his post as executive director for the Puget Sound Partnership at the beginning of December to take a new position at the University of Washington’s College of the Environment. Check out my story in today’s Kitsap Sun. To maintain David’s expertise on the partnership, Gov. Chris Gregoire has appointed him to the Puget Sound Leadership Council, the governing body of the organization. From my perspective, David Dicks has been great to work with the past three years. Whenever I’ve had questions about something, he has taken time to explain things at great length. And his staffers were available at a moment’s notice. Even when the partnership ran into financial-management troubles with the State Auditor’s Office, David stepped up and explained how the problems occurred and what had been done to correct them. I’m not sure David realized in 2007 what pressures he would be under when he took this high-profile job as the son of a U.S. congressman. It has been impossible for anyone to disprove the notion that he only got the job because he was Norm Dicks’ son. His standing apart from his father was not helped by the fact that Norm was bringing big dollars into the state for Puget Sound restoration — even though Norm was doing that long before his son came on board and would have done that in any case. David Dicks became the target for those who dislike his father’s politics as well as those who believe the Puget Sound Partnership is a waste of time and money. The question remains: Given these circumstances, was it ever a good idea to appoint David Dicks to lead this new agency?